Sukhi Singh (second from left) with her family. Meet Sukhi Singh, a tenacious and battle hardened entrepreneur, who went from selling home-made curry pastes at Berkeley Bowl and farmer’s market to founding a multi-million dollar food company in San Francisco bay area. ”We bring Indian food to the mainstream table,” is how she describes her company. Singh started her entrepreneurial journey with with a blender and a bucket in her kitchen, where she conjured up different curry pastes. Today, her company Sukhis is part of the fastest growing ethnic food market in the US. 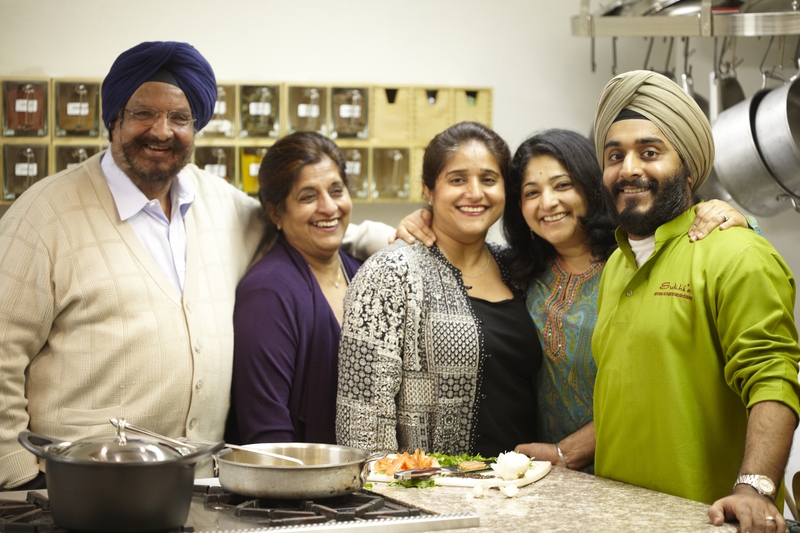 Guided by her instincts and a passion for cooking Singh went through some rocky times in the first few years of her American journey. Singh along with her husband and their 3 children migrated to the USA in 1984 and settled in the San Francisco Bay area. The couple bought a deli, but they lost it during the 1989 earthquake, which is when she switched to creating curry pastes in her home kitchen. She was 45 yrs old with 3 kids and in the red by $70,000. Times were tough for the family and sometimes they bought groceries using their credit card.Her husband asked her to get a job, but Singh stuck to her instincts and told him she was going to make her business work. And through sheer dint and hard work she made it work. Today, Singh’s is a multi-million dollar company that employs 120 people. Her husband and 3 children work with her. Her son designs the packaging for their food products, while her daughters take care of sales and marketing. Her husband is in charge of the company’s finance. And Singh spends time in the kitchen testing and creating new products. Sukhis food products are available in various grocery stores including Whole Foods and Costco in the US. Singh still uses the local farmer’s market in the San Francisco Bay area as her testing ground. Singh and her family live in the San Francisco bay area. This interview with Singh was originally aired on TV in San Francisco bay area. You can watch the video interview on my YouTube Channel.